The episode, titled “The Predators of Shark River,” will bring viewers face-to-face with the Everglades’ most important predators, including bull sharks, snook and the American alligator. It will air Saturday, May 23 on ABC. Air time can be found by checking local listings. 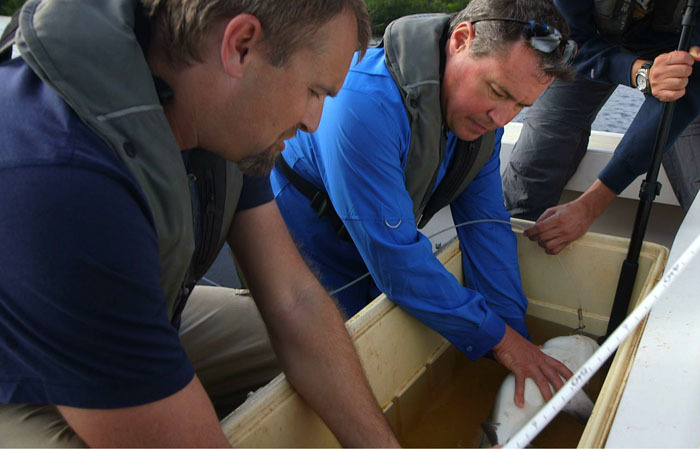 FIU marine scientist Mike Heithaus (left) and Jeff Corwin (right) examine a baby bullshark in Everglades National Park. Environmental Sciences Professor Jennifer Rehage and Ph.D. student Ross Boucek will show viewers how they examine and add tracking tags to fish before releasing them back into the water. This data-collection method is part of their studies on the effects of climate change on fish populations in the vast tropical wetlands. College of Arts & Sciences Dean Mike Heithaus and researcher Adam Rosenblatt, will explain why the once-endangered American alligator is important to understanding the Everglades ecosystem. Heithaus is known internationally for his research on predator-prey interactions on community dynamics in marine systems and the ecological role of large sharks in Australian and Florida waters. Past episodes of “Ocean Mysteries with Jeff Corwin” can be viewed here.